300, 500 or 2500? How long should a blog post be? A client of mine wanted his site to be ranked first on Google, and we got into a heated discussion because he tried to support his point about how many words should be in a post on his newly created blog so he can rank at the top of google. He argued based on his experience within his field of work, while my SEO experience marked a trend towards “more is better” (at least in his niche). Although it was difficult for him to understand the motives behind my successes, and still is, I managed to give him enough reasons to at least re-evaluate his position. There are no established rules and, bloggers, marketers and SEO experts all pitch something different depending on the niches. In order to decide how many words the post should be, it is necessary to determine the primary source of where the users who will read the post are coming from; That is the distribution channels. Where will users come from? How Many Words Should a Post Have if it’s meant to be shared on Social Networks? When a post is intended to be distributed through social networks such as Facebook it is usually for entertainment. A post for s social network should be between 750-1500 words. For example, a 1500-word post with an engaging entertaining title with quality (or controversial) content tends to be shared more than, say, 500 words. Sending links on a recent posts to your email list is very important and will guarantee that you get repeat visitors to your site and some engagement and shares. Posts that are sent via email can get a lot of comments without necessarily being extensive. In these posts 300 – 750 words is the sweet spot. The post should be entertaining, useful and even thought provoking enough to generate engagement. How Many Words Does an Post Have to Have for the Search Engines? In Google the posts that rank the highest are usually very detailed long posts. The data indicates that when a user has an interest in a subject he expects to find as much information as possible and at the same time allows him to clear doubts and clarify concepts. If the length of a post is so important for ranking on Google, then why are there some post that are in the top positions and have no more than 500 words, ranking higher than those that have more than 1000, 1500 or 2000? Because it depends on what a user is looking for and other factors like external links and on-page SEO. Below are two examples of what users look for. The post with specific data are those that consist of very specific information on a topic, usually responding to a question and are backed up with statistical data, reports or studies. Users who search for that keyword are expecting to find in the search results very specific data and information to support this data. When we talk about extensive information we refer to any post that contains very complete information on a particular topic. These types of posts are much more extensive and profound. A extensive information post includes specific data and information that supports them as sources, case studies, ests and / or statistical data. For keywords like these a user expects to receive extensive information. What do the Experts say about the length of a Post? According to Marieke van de Rakt researcher and project manager at Yoast a post must have a minimum of 300 words to rank in a search engine; However, the longer posts are better ranked because they give a better idea to search engines like Google about what the text on the post is about. (Ref . : https://yoast.com/blog-post-length/ ). 300 to 1000 words: The minimum length for a post should be 300 words. With 300 words, a search engine can determine what the content is about and a reader can get specific information about a topic. 750-1500 words: The length of a post that is intended to be distributed on social media must be accompanied by a great title and content entertaining and controversial. 1000 to 2500 words: Larger articles provide more information to searchers about what a topic is about and are ranked higher in search engines. 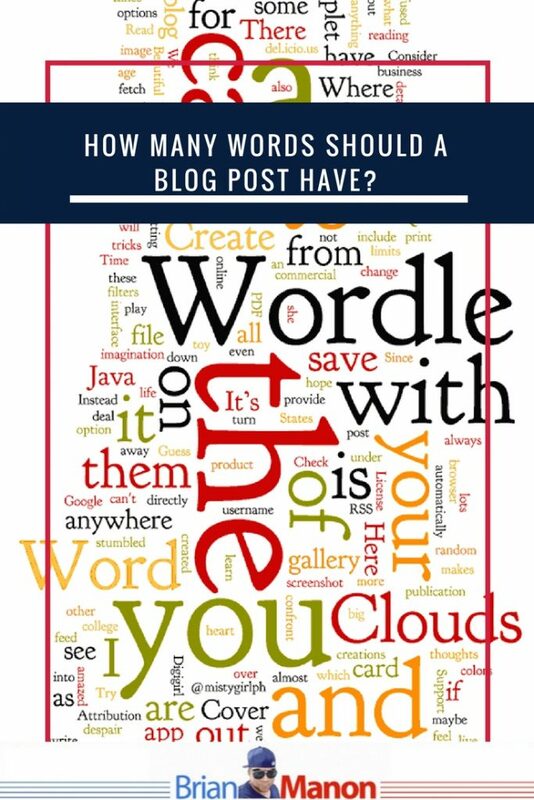 From your experience, how many words in a post have you found works for you and your niche.? Let me know in the comments below. Thank you! This was a very interactive post for me as I never know how to limit myself. Very informative post. There is a tool called Semrush, this tool has a seo template where based on your targeted keywords, it will suggest how many words your post should be. I’ve done shorter posts and longer posts. Both have done well, but I always try not to focus too much on length and instead say what I need to say in the words that it takes. Most of my top 10 posts though are at least 1000 words in length. This post is very insightful. I have not come across any other article that breaks down the topic of word count to this level. Thanks for sharing! Yay, super long posts for the win. I try to keep mines at a minimum 1500 words. I often wondered how words I should use on a post. Sometimes I am long winded. Others I am not. My recipe one are shorter but I try to have around 500 words. Am I selling my short on my recipe posts? I completely agree with you on the word count for social and SEO reasons need to be up to 1500 words, Google says around 1000. Many people have short attention spans though. For me, if they don’t want to read they don’t want to read. I stick to longer because I’ve had the best results. Interesting! I am kind of long winded so mine are usually pretty long but sometimes short and sweet and to the point is what people prefer…I know when I read someone else’s post a lot of the time I kind of skim it and look through the subtitles to get the highlights. Lots of great information here. I always wonder this, but I try to think about what I like to read. I tend to enjoy more posts that are not wordy, and have lots of breaks to separate thoughts. When I see one big post, that basically looks like a school essay, i tend just skim short parts of it. This is very helpful! You always hear such differing opinions you don’t know what to do. Thank you so much for sharing! Question – how did you make that table of contents? Is it a plugin? Really insightful, I had never given the lengths of my posts much thought, you have definitely given something to think of. Good point and discussion! This is so informative. I will try to read your other posts, I might also find more information about blogs and posting. Thank you very much for providing such a useful article. I found a big value in it and I hope others will as well. I am really trying to find that sweet spot and thinking that 750 to 1000 might be it. This is such a nice break down on how to approach a blogpost. I always think if I should make my travel posts into parts or have one single loooong post. Thanks you for giving me an overview. Interesting post, well-supported. I agree that it depends very much on what your objective is, and this is definitely not for the faint of heart! Although I’m sure for you this is a given, I tell my clients that blog posts should be long enough to get the point across to their audience, and no longer. I tend to write anything from 20O to 1k words depending what niche I’m blogging about. Although I don’t always write content with 1000 words I learnt to write content with at least 300 words. If you have the Yoast plugin for SEO this also helps you write content that will rank higher for SEO. Finally, someone who understands that there’s no set number of words that you have to have in order for your post to be good. I can’t stand “experts” who claim that, if your content doesn’t have x number of words, no one will read it or share it. I call bs on that. Agreed I write some of my blogs over 1,000 words and some are 400 words, I think as long as the content is good I think that is what matters. Great post thanks for sharing. Good post. Learned something new here about post words. This is great! and I was thinking about this myself the other day so it’s good to get someone else’s perspective on it! Thanks for sharing! I think it depends on what you are writing about. Sometimes there’s a lot to say and sometime’s there isn’t. I’ve always gone with the rule of thumb of the SEO plugins. It flags me if I have less than 300 words. Other than that I’ve heard of colleagues splitting posts up if there are more than 1000 if possible. No matter what I try to break up paragraphs and use headers more than less to make it scannable. Great advice! I’ll check out that plugin later, thanks for sharing! This is very helpful information. I try not to get caught up in the numbers, but it’s definitely something that should be given some serious thought! Thanks for sharing! Very informative thank you. I was always worrying that my posts were to long compared with others I have seen. Thank you your post has really helped. All good things to keep in mind when determining how long posts should be. As a food blogger, my posts always include a lot of photos, so I tend to write less…..but after reading this I will try a few post with over 500 words and see if it makes a difference. THanks for the tips. Informative! Great for those who are starting to blog and don’t know how to plan their content. The Concrete Data and Extensive Information sections will surely give new bloggers an idea when they’re writing their new post. 2) “case studies, ests and / or statistical data.” There is a t missing. Very good information. In my experience, the more you write, the better it could be. But only if you write something with great grammar and write something meaningful. Being an editor, I have seen some bloggers and writers lose their audience because they failed to put effort into the grammar and punctuations of their posts. Those posts had wonderful information, but failed to hold the interest of their readers. Thank you for giving us your insight! Most helpful. Goog topic. Very well explained! Awesome post. You answered a lot of questions i had. This is all great info. I’ve never even out thought into word count. Thanks for the great information! I had never thought about the effects my word count would have on increasing my traffic. The length of blog post depends on your purpose of writing the blog and the length might differ depending upon the niche. Very, very informative article. I think we tend to forget that numbers, even though they are just numbers, in the blogging world actually matter. Thanks its really good… will read it again before writing a post.